I’d like to make the case that asparagus, as a crop, is a prophetic vegetable. How the global asparagus industry has changed gives us a window on how the rest of the US fresh produce market is likely to change over time. 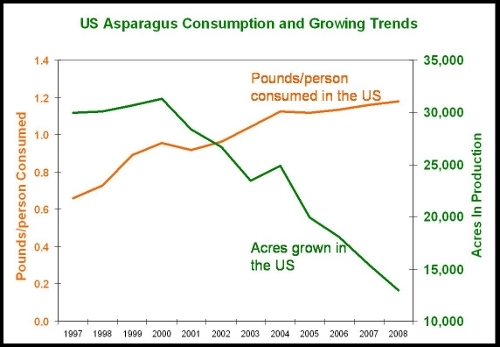 As you can see in the graph above, Americans doubled our per capita consumption of asparagus between 1997 and 2008. That is a good thing because this delicious vegetable is high innutrients like vitamin K, folate, vitamin C, vitamin A… and also contains healthy phytochemicals like glutathione and rutin. Asparagus is still a relatively small part of our vegetable consumption at 1.2 lbs/person compared to broccoli at 5.9 lbs, sweet corn at 9.2 lbs, or fresh tomatoes 18.5 lbs (USDA data). 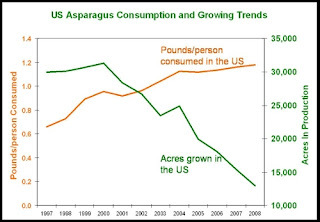 But what is interesting is that during the same time period that we doubled our consumption, the acres of asparagus grown in the US has dropped in half. Why the disconnect? There are several factors involved and many of them represent trends and drivers that will probably effect many other categories in the future. We seem to be unable to have a civilized conversation about immigration policy in the US let alone actually institute a sane guest worker system for the people who do so much to tend our fruit and vegetable crops. Because of this, labor is sometimes scarce, sometimes costly and fraught with potential legal issues for farmers. This is increasingly problematic for all labor-intensive crops, but particularly so for asparagus. During asparagus harvesting season in the spring, the shoots have to be carefully selected and cut as they emerge from the ground. No one has perfected a mechanical harvester that can do the job, so relatively skilled pickers are needed 7 days a week. Asparagus is a perennial crop which means that to start a new block, a grower needs to be confident that he/she will be able to find and pay for all that labor for many years (10-20) to justify the commitment of time and money to a new planting. Our political dysfunctionality is a big component of the uncertainty that is undermining farmer’s confidence and thus their decision about planting. Combine that with demographic trends, and look for a food future where only crops that can be harvested mechanically will prosper. The US government funded research and support to develop asparagus as a crop for South American farmers with the goal of giving them alternatives to growing drug crops. They also created an Andean Trade Preference. This was quite successful in the 1980s with relatively small growers selling to processing companies that exported canned and frozen product. The industry stagnated in the 1990s as those processed markets shifted to China. To survive, the asparagus industry started to shift to fresh exports and this tended to favor larger players as is always the case for fresh produce that is sold to distant customers with strong leverage. Consolidation is already a long-term trend in US fresh produce, and it will continue both here and at our import sources. Sourcing from China will be a continuing trend as it is now for many organic commodities that are not perishable. The most successful asparagus cultivation has been in special micro-climates in the “rain shadow” of the Andes mountains, particularly in Peru. Here there is land for planting where there is NEVER any rain. There is irrigation water available. Some sources have been in elaborate irrigation systems for thousands of years. However, there are concerns about its sustainability because of climate change or excessing pumping from some aquifers In any case, it turns out that asparagus can be tricked into going dormant most times of the year by inducing drought stress. This allows the Peruvian growers to have different fields set up to be harvested at different times. 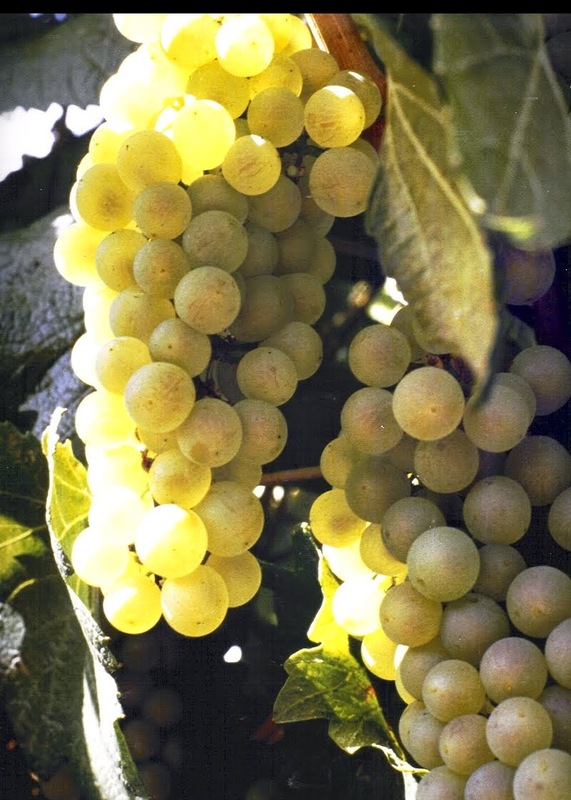 There are not places in the US, Mexico or Canada that have the right combination of dryness and temperature to do this, so Peru supplies our market for most of the year when North American pickings are not available. Many people are advocates of “seasonal” produce consumption, and it is important, but the reality of consumer behavior is that we learn to eat things in greater quantities when we can count on them being available. This and retail marketing tendencies will continue to favor year-round offerings. Asparagus is actually a vegetable that is better suited than most to local production. It can grow even in relatively cold places as long as it has a good summer to store energy in its underground “crowns” that then enable it to push up as new shoots for the several week harvest window. Many states used to be significant producers of asparagus including places like New Jersey, Michigan, Washington, Illinois and Indiana. One of the most advanced asparagus breeding efforts in the world was at Rutgers in New Jersey. Asparagus will be an important test of the strength of the “Local” and “Seasonal” food movements. There are many factors that will militate against these goals for asparagus, not matter how good it sounds (and it would be really great and fresh). First of all, agricultural labor supply is even a bigger uncertainty in many of these regions. Also, who would make a 15-20 year commitment to a piece of land near a city that could have development potential? Asparagus would not be a good candidate for a U-Pick because you really need to know what you are doing when harvesting or you compromise the life-span of the crowns. People like to blame “Big Ag” or “Industrial Farming” for the trends in our food supply. Asparagus is a good example of how what really happens is driven by forces such as economic realities, consumer behavior, retailer leverage, politics and weather. Farmers, at any scale, must simply respond to these drivers or go out of business. Here is a challenge for a grocery retailer that wants to make a public commitment to local production. Give someone the financing and long-term contract that would allow them to devote some land to the production of local asparagus. Set the contract pricing in such a way that the labor will be available and affordable. Although composting has a very strong “green” reputation, it isn’t without it’s environmental issues. Compost is an important source of fertilizer for Organic crops, and is widely promoted as a “green” alternative to synthetic nitrogen. The inconvenient truth is that, as a nitrogen fertilizer, compost has a carbon footprint more than 10 times as large as that for the synthetic nitrogen used in conventional farming. It will never happen, but if a significant percentage of crops were ever to be fertilized with compost, it would be a very bad thing in terms of climate change. In July of 2009 I posted an obscure document about this topic titled, “The Carbon Footprint of Organic Fertilizers” on Scribd. It just passed 5000 reads, and that inspired me to write another post about the conversations I’ve been having on this topic for the last two years. Why Such A Big Footprint? The reason that compost-based nitrogen has such a big carbon footprint is because, during the composting process, micro-sites in the pile run out of oxygen because there is so much being consumed by the microbes. Under those circumstances, other organisms make methane or nitrous oxide (21 and 295 times as potent as CO2 as a greenhouse gas). Two to three percent of the carbon is emitted as methane even in a very well run, commercial-scale composting operation. Because it takes many tons of compost to provide the fertilizer for an acre of a crop – the greenhouse gas contribution per acre is very large. The conclusion from this is not that composting is a bad thing, but rather that it is definitely not an acceptable fertilizer alternative for the bulk of agriculture. Manure is a major waste product of animal agriculture. It has many environmental downsides, but it also provides the fertilizer for about 5% of US crops. Greenhouse gas emissions that come from “manure management” are certainly related to animal product production, but there are areas that pass the boundary. If manure needs to be composted to fit the USDA Organic rules and/or to be safe to apply to a food crop, then the emissions that occur during composting can be assigned to the farm that uses it. This is no different than assigning farms the footprint for the energy-intensive manufacturing of synthetic nitrogen fertilizers. What Would Have Happened To This Waste If It Wasn’t Composted? This is an important question. If you compost your vegetable scraps instead of sending them to the landfill, you are way ahead even if small scale composting has some greenhouse gas emissions (I’ve never seen a study on this). This is because far more methane would have been generated in the land fill. If manure is not composted but simply stored for a while and spread on a non-Organic, non-food crop like field corn (this is the normal scenario), there are still some methane emissions during storage. Thus it is fair to deduct that storage-associated level of emissions from the footprint of composted manure (it still comes out larger than for synthetic nitrogen). What Would Be The Best Use Of The Waste Stream? “Waste is a terrible thing to waste.” Whether it is manure or some other organic waste stream (yard waste, food scraps…), there is energy potential in every ton, and it often has more economic and environmental value as a renewable energy than as fertilizer . There are technologies like anaerobic digestion or fast pyrolysis that could convert this waste to energy and offset fossil fuels. Composting definitely has its legitimate place in our need to deal with wastes. Compost can also be very good for building soil quality. It just isn’t a good way to provide nitrogen for crops. The anti-climate-science politicians from the Right and the anti-technology activists from the Left are independently, but quite successfully, increasing the risk of malnutrition and/or starvation for the poorest people of the world. This may not be their intended agenda, but it is the likely outcome from what they are doing. There are rumblings today of another "food crisis" like that in 2007/8. There is every reason to believe that food shortages will become more frequent and severe over the next few decades of overall human population growth. (See map above for where projected population growth will occur). By 2050 we will need between 50% and 100% more food. This cannot come from farming new land - it needs to come from producing more on the land we already farm. Fortunately there are a lot of dedicated people striving to make that possible. However, because of the enormity of this challenge, there will be shortfalls because of weather extremes or pest pandemics. There will be times that food is too scarce and far more expensive. For those of us who live in relatively rich countries, the risk is that our lives will be somewhat disrupted, but for the hundreds of millions of the world's poorest inhabitants, the risk is true suffering and even death (not to mention political instability, mass migrations...). This risk is real and it is increased by the powerful forces that drive the anti-climate-science agenda from the Right and anti-technology agenda from the Left. It is no surprise that the science behind something as complex as Climate Change carries some uncertainty and some disagreement among scientists. Unfortunately, that normal feature of science has become fodder for conservatives who don't like the policy implications that come with the consensus conclusion: we have a problem, and we are likely the cause of that problem. If climate change is real, we can expect to see a wide range of weather extremes and other basic shifts that will make food production even more challenging than it has always been. If we do nothing (and the recent election results make that almost certain), we will eventually see exagerated food supply crises. The greenhouse gas emissions are driven mainly by the rich. The increased food insecurity will be felt by the poor. If the anti-science Right is wrong about climate change, the risk isn't so much about "charismatic megafauna" like polar bears - it is about starving kids. Convincing most developing nations to adopt a European-like regulatory structure for GMOs, so that it is now unlikely that biotechnology will be developed in time to help feed the most rapidly increasing populations over the next 50 years (e.g. virus resistant cassava, drought tolerant corn for sub-Saharan Africa). Convincing most developed world governments to dramatically reduce their investment in agricultural development research that includes any technology component and attacking groups like the Gates Foundation for stepping in to fill that void. Using intensive litigation to make the cost of developing newer, safer and more effective pesticides prohibitively expensive. Pushing the EU to apply the "precautionary principle" to agricultural technology regulation. This limits crop productivity in the EU at the same time that rich population is doing a "virtual land grab" for food imports that is equal to the land mass of Germany and growing. All of these actions combine to slow the rate at which food production can be increased, and that increases the probability of shortfalls in the future. Most of this anti-technology activism is again concentrated in the rich world which will be largely insulated from food insecurity. The poor people they "protect" from technology will be the ones at risk of insufficient food. Both sides can probably see how the other one is raising risk for the poor, but they seem to have difficulty seeing how they are doing the same thing in a different way. In any case, these forces on the Right and Left are succeeding, and there seems to be little we can do about it. You are welcome to comment on this site or email me directly at feedback.sdsavage@gmail.com.